I don't know what's going on over here. I spent another week practising quilt avoidance and with about 5 weeks until the end of the year multiple quilt finishes are looking less and less likely. I'm still hopeful of knocking off a couple of quilts, but beyond that I think I'm stuffed. So my question is: Do I admit defeat here and now or go for the big stressful effort as I dash to the end of the year ? It's not all doom and gloom . I have finished stuff. Just not the stuff I need to finish, which makes me feel like a slacker. Miss P 's Pyjamas got a waistband. I did manage to stitch in the ditch this week in the centre of my Blue and Brown quilt (that quilt still needs a snappy name ) But I also spent some considerable time un-sewing all the previous scallopy quilting I had done because I decided I hated it. And with the quilting I'm now doing I'm going to have to bury about a billion thread ends which I've never done before and the thought is making me slightly sick. And the octopus monkey is firmly ensconced in a plastic bag where I am hoping it will suffocate. To see people that have actually achieved their goals and have not sat round twiddling their thumbs and practising quilt avoidance go on over to Kate's for a looky loo. If I don't find some quilting mojo soon I make take up ceramics. Well done on the things you have completed but get cracking on those you have been avoiding or you could end up like me with UFOs over 6 years old! I am sure there is a society for he protection of half finished stuffed animals that end up in a bags. You are too hard on your self look at all the finishes. I am sure you will HATE ceramics. Let's see. Don't stress over the quilts. If they get done, then hooray! if not, you'll get to them eventually. Those pyjamas are seriously cute and the other finishes are terrific. I love the cushion that goes with the dresden quilt (see I didn't call it a pillow). and the stocking is super cute! I'd offer to help you with the quilting but I'm not enough of a perfectionist to do it for someone else (not to mention I live on the other side of the world). 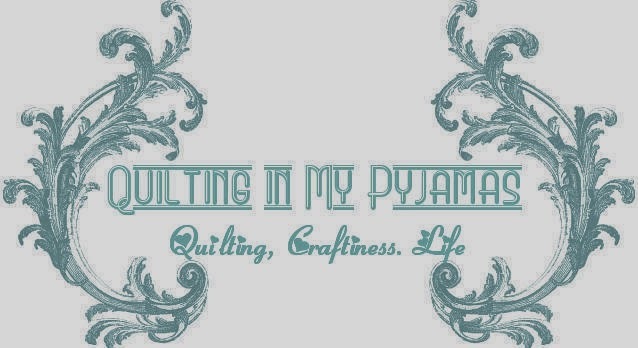 Don't stress over quilting .. that's not what it's about. From someone who has not complete in a year, what you have completed in month, I'm thinking your finishes are rather impressive. Could it be you made your list too big? I sure wouldn't stress over what you haven't finished when you've finished so many wonderful things. Hahaha - love the monkey suffocating in a plastic bag - he is still adorable, but I know what you mean about those types of things - yuck to make! Huge Chuckles.....Poor monkey! Love the PJ's and I adore your dresden plate. You've some beautiful projects in the wings there Shay too. I'm a middle of the road gal. Don't admit defeat, but don't make a mad dash push to finish them all. Pick one or two (or three if you're really feeling spunky) and commit to finishing those, and put the others aside until next year. Problem solved. Easy peasy, right???? LOL. Just kidding... Major thumbs up to all of things you did accomplish! I'm jealous. Well you do have some Finishes to Brag about which are all Great... I have a Monkey that is Suffocating too...must be his Twin! My quarter-finished stuffed animal is in a drawer...where I don't have to watch him suffocate. You did get some stuff done! Tell more about the tablerunner! Whatever you decide to do hun don't stress. Don't pressurise yourself to do the unnecessary, they aren't going anywhere. As always what you have done is beautiful, just like you!! LOL! I have a big avoidance pile as well. Funny how something as minor as a loop and button can delay a project for eons, eh? Nah! Ceramics are no where near as warm and fuzzy as fabric stuff! Give that a miss. I think you have done great this week. Don't be too hard on yourself. (Remember the epic shopping trip? You had less time this week! Ditch the shopping and sew instead. And just sew what makes you happy!) Don't put pressure on yourself to have a bazillion quilt finishes, but don't rule any out either. It still could happen. Especially if you don't feel pressured! Just sew what takes your fancy. AND maybe start something new! (Lol! I know. It's a disease and I just HAVE TO spread it!) Off to start something new myself right now!!! Who defines what you "need" to finish? If it's you, then you can change the definition Two little finishes and one big unpicking project don't sound like avoidence to me, more like you jumped in with both feet. Do NOT go for the big stressful push. I am proof that it just pushes you over the edge. I'm coming over to eat chips and drink wine with you while we stick pins in the monkey. I can't help you finish all your projects, but perhaps this might help with threading all the thread ends into the quilt: self-threading needles. They make a tedious job less so. You are way too happy a person to be put into stress....there is a song..."don't worry be happy......think of that and just do what you can. You achieve so much anyway.....and besides you dont want to be left with nothing to do next year do you. Love those jamas....even an old chook like me would wear them. The monkey in the bag comment made me snort-laugh! Well, will you look at you starting and finishing things in the middle of avoiding others. It's all going to come together somehow, don't fret. All in due time, my pretty. I must not be taking the right drugs or something because I spent a few hours standing over the ironing board and cutting mat today but still don't have a whole quilt cut out. Poor, poor monkey. I may have to report you to the ASPCA. You do so many beautiful things. That cushion to go with the dresden quilt is amazing. Little P's stocking is so cute and Miss P's pyjamas are adorable. I think there is a happy medium between giving up completely and making an insanely mad dash to finish your projects by the end of the year and not feel like a failure. Keep working on things and don't let it stress you out. Work on what makes you happy at the moment and you'll get more done. Good luck! You are my hero in so many ways. As a non lover of sock monkeys, the monkey is where it belongs. I still think you should turn it into an octopus., although I really like Susan's idea of sticking pins into it. Two finished projects is great, even if they are small, it's better than no finishes. DO NOT push yourself to finish anything unless you really feel like it, I don't want to have to visit you in the local psychiatric ward. Ceramics is not a viable alternative. There are some impressive finishes there - Miss P will look gorgeous in her new PJ's. How cute is that stocking in blue with Rudolph and friends, perfect for Little P.
Poor Occy,oops meant Monkey - sure hope it isn't wet in that bag! Enjoy the cushion it is very pretty and looks like it will be ready before the quilt - Yay. Have a wonderful week of 15mins! Poor Monkey!! i'm loving all the things you've been working on. The blue christmas stocking is awesome!! And that table runner to die for!! Maybe to get all your projects done by the end of the year you could turn Christmas Day into a sewing party. Get everyone to pitch in and help and they'll be finished in no time. I think you should put you energy into cooking and eating. I forgot about you Christmas quilt! Love little P's stocking and the pj's. Totally jealous it's tank top weather. And I meant "your" Christmas quilt. I think you did a great job in the sewing room! Who says we have to work on quilts? Lovely, lovely, can't wait to see finishes on those quilts- they look beautiful! I've been having more fun sewing clothes too for some reason, but did get a chance to make some progress on a majorly avoided quilt- hand quilted. Got a lot done in the car, now I need to get working on some more avoided quilts. Also, I LOVE the PJ's you made for Miss P! !